A bit of everything. But mostly miniatures. Last weekend was CaptainCon 2018. It’s the first big con I was able to attend since GenCon in 2014. TempleCon (which I attended multiple times, and was my first convention ever) and CaptainCon ran parallel for some time, but the latter is now held at the same venue and time slot as the former, that is sadly now defunct. I felt almost right back at home; similar gaming setup, similar game selection, even some of the vendors had the same spot! 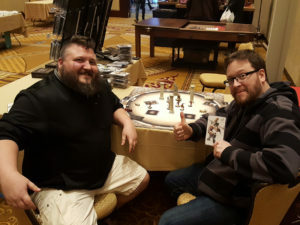 My goal with CaptainCon was simple; enjoy the road trip with the guys and the time away from the family, and play & test games I don’t get to the table often enough back home. The trip overall was great. 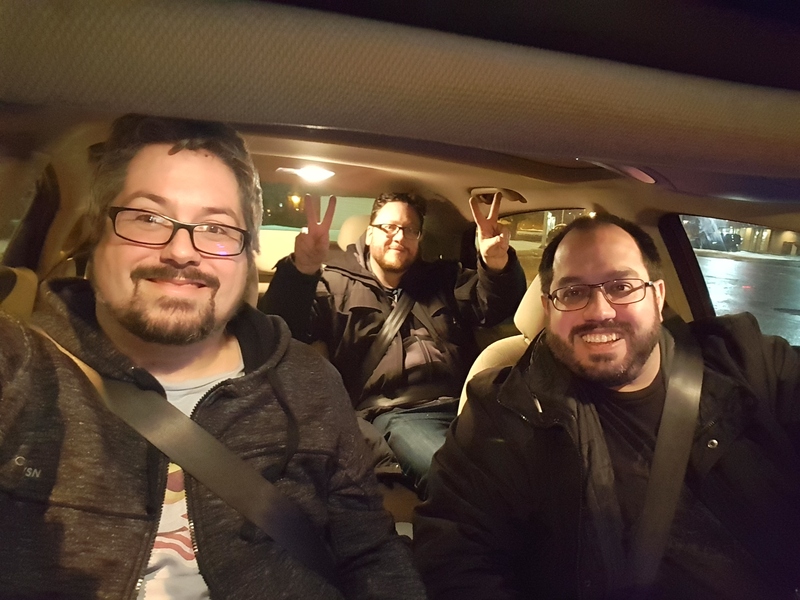 I had a blast with my pals and Geeks of the North co-hosts Yaum and Paul. Fun talks, good food (including the traditional chowder bowl at Iggy’s), even some planning for the upcoming Colore ton Monde. The only bad part was the weather on the trip back, when we hit freezing rain and an ongoing snowstorm. Going 30km/h on the highway makes for a long drive back to Canada… Paul was a trooper though, and brought us back in one piece. 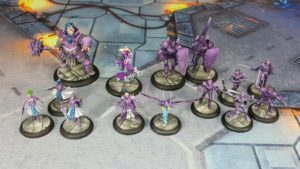 In the month prior to the event, I had a painting rush to complete playable forces to use over the weekend. I widen my ARC collection for Pulp City, added a new model to my Legio XIII for Arena Rex, and got an at least base coated and based Shattered Sword force for Relic Knights. 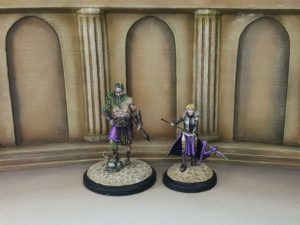 I only had to finalize those steps on Cordelia Clean, one of the Radiants model for RK, one evening at the hotel, to have the 50 points, the game size required that weekend. I did stick to my game plan! I got all the games I brought with me (Guild Ball, Pulp City, Relic Knights and Warmahordes) to the table, and played in a bunch of demo or scenario games. My favourite one was Pulp City, which I played with Deven, one of the game dev. It was fun, fast and full of laughter! We even got Yaum to try it, and he liked it enough to also jump in. The new version of Relic Knights was also interesting. The change from the Activation Queue mechanism to Combat Points was less drastic of a departure from the original play style than I feared. I do not regret rush painting my Paladins, and I am looking forward to testing it out some more. On the demo side, the list goes like this: Arena Rex, Dust 1947, Hero Realms (a card game), Runewars and Processed (board game). Arena Rex was the clear stand out in that list, but it wasn’t an hard sell, already liking the concept enough to have bought models the year before and started painting them. Shout out to Walker that tolerated us at his booth far too many times over the weekend. Amongst the completely new stuff, the two non-miniature games rose to the top. Processing, a game of cow and hipster farming guidance for our benevolent alien overlords, shows a lot of potential. We were playing a prototype with Seppi, Fight in a Box’s designer, and I will probably back it when it goes to Kickstarter later this year. Hero Realms I had a side knowledge of, having already played Star Realms, its space variant older brother. I did enjoy the fantasy theme more though, and the hero custom started decks look interesting, as well as the fact that it goes up to 4 players, instead of being stuck to 2 players max like its sci-fi brethren. There was also a painting contest, and I did bring some stuff to enter. However, the categories on the website were unclear and slightly confusing. In the end, I should have brought a bit more stuff. 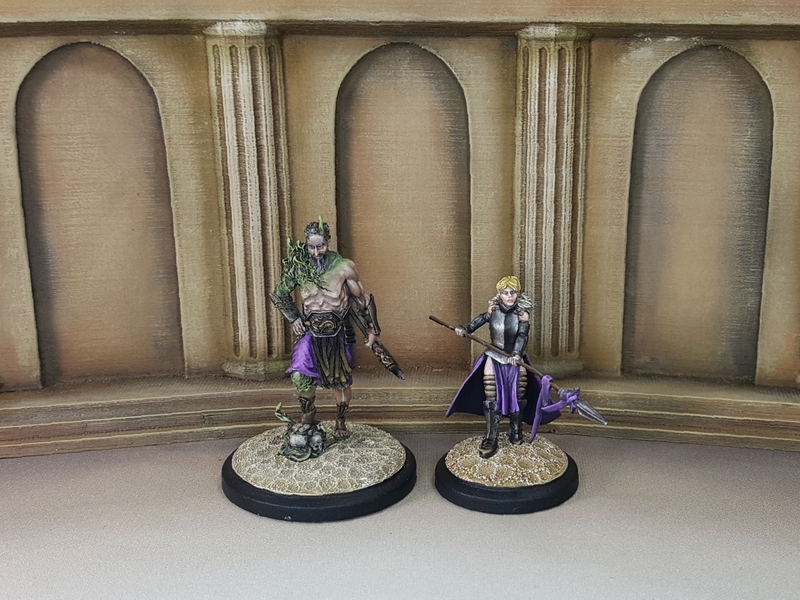 I did make a podium in two of the three categories I entered, finishing 1st in Epic scale (15mm or lower) with my Knight of the Kiln, and 3rd in Units with my GB Butchers’ Guild. 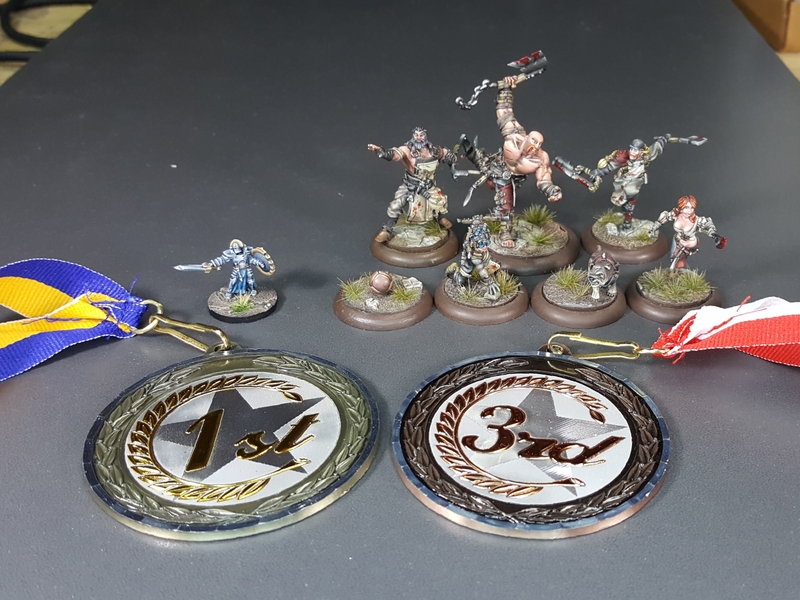 Pretty happy with both, even if that gold in Epic scale ended up a default as I was the only painter to enter anything in it… I did receive great comments about the piece anyway, and it might have fared similarly even with competition. The contest overall was a bit disorganized, and might need some tweaking in later years. The number of entries was capped to what entered a single Ikea’s Detolf case, which is not that many. Also, the Chibis were an optional modifier for official categories in the documentation, but ended up being judged separately, while Busts ended up combined with Single Infantry. Weird choices, but fun anyway. Kudos to Yaum for scoring three 1st places! Overall, the trip was a blast, and I would go again if I can arrange it. I met a lot of interesting new folks, rejoined with past conventions friends, and had a great time with Yaum and Paul. Those are the core reasons to attend this type of event for me. Now that I might be able to attend multiple days events more often, I’m looking forward to CCBB and the new Armatura later this year. Both are held in Ottawa, and hopefully having them so close geographically will make it easier on planning. Hi. So glad you had fun at CaptainCon and that you all made it back safe after the show. Congratulations on your painting wins. To quote the judges “even if there were others in the category your 15mm entry deserves the win.” That model is absolutely amazing! I’m so glad to hear your perspective on the show as I’m a bit too close and it’s good to get additional perspectives on what it was like so we can tweak for next year. 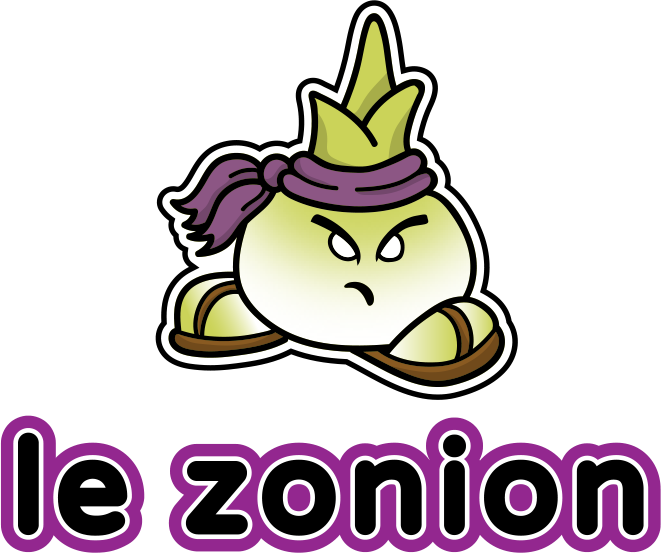 As one of the organizers, I feel obligated to provide a bit of an explanation and apology on the painting contest. 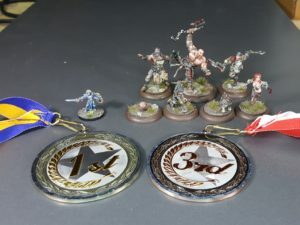 The categories were based off the Cool Mini or Not Crystal Brush format and we ran into a few areas where there were unanticipated gaps (busts, epic scale, etc.) we scrambled to close at the 11th hour. We’re fixing that for next year already. The cap to entrants was 100% my fault. We own two of those glass cases used to display and protect the entered models. However, when packing for the show we missed putting one of the boxes into the truck – the one that contained all the metal braces needed to hold the case together. We sent a runner out on Friday afternoon to purchase a new case in order to hold this year’s entrants and thus ended with half the space we normally have. We couldn’t take more than would fit in the case for concerns of safe storage. The good news is now we have 3 cases for next year.